What Day Of The Week Was August 13, 2011? 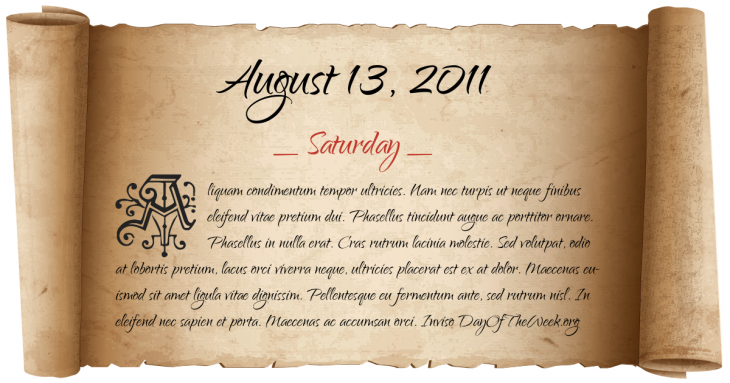 August 13, 2011 was the 225th day of the year 2011 in the Gregorian calendar. There were 140 days remaining until the end of the year. The day of the week was Saturday. The main stage collapses at the Indiana State Fair in Indianapolis during a hurricane-force wind gust ahead of an approaching severe thunderstorm, killing 7 and injuring 45.